nocytes may coordinately cause the fluctuation of the thickness of the epidermis at the wound site in rat neonates. been revealed by immunohistochemical analyses [6,8]. cell death and the action of caspase-14. occasionally occurred (Koizumi et al., 2004). the abdominal cavity of rats. according to the manufacture’s instructions. 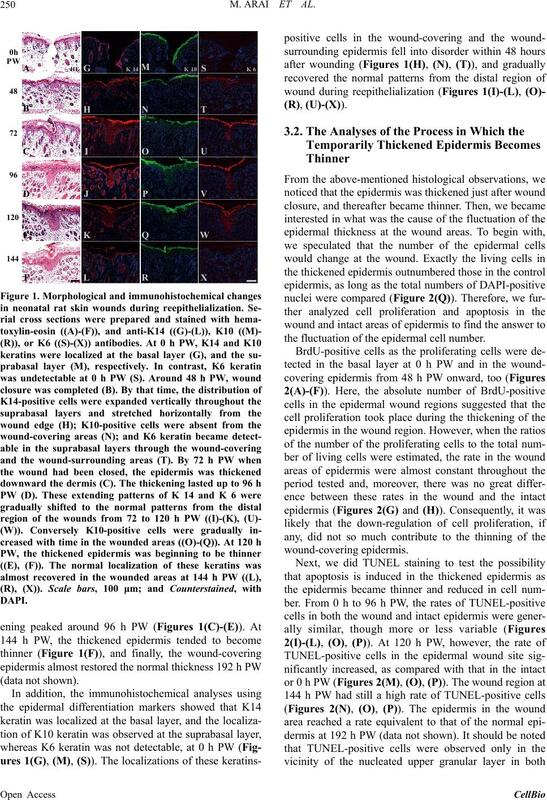 the fluctuation of the epidermal cell number. and dermis; *, p < 0.05; **, p < 0.01; and Red asterisks, comparisons of intact values. 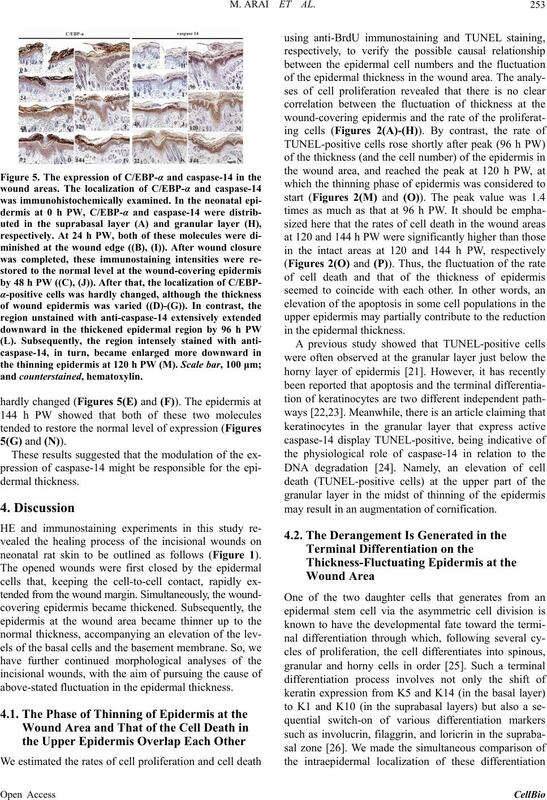 of the epidermis at the wound region. tion marker proteins during the terminal differentiation. tween the epidermis and dermis. normal expression pattern (144 h PW, Figure 3(F)). neonatal rat skin to be outlined as follows (Figure 1). above-stated fluctuation in the epidermal thickness. may result in an augmentation of cornification. these proteins in the normal neonatal rat skin (Figure 3). 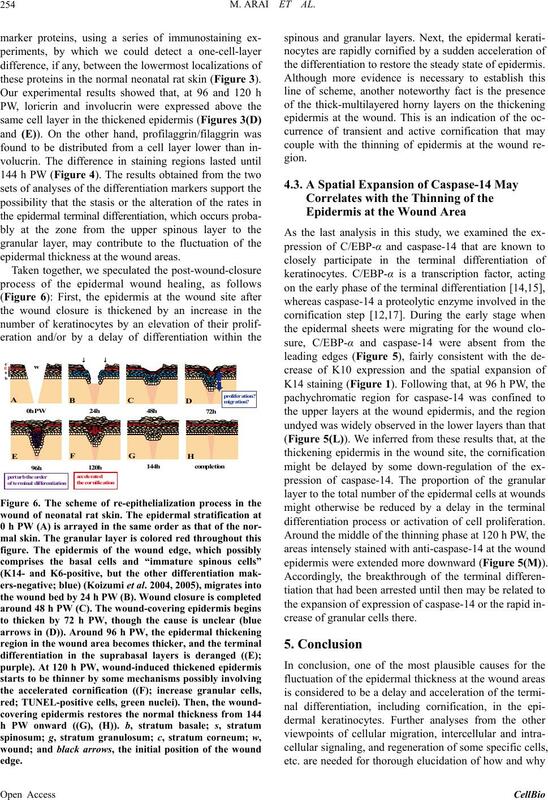 epidermal thickness at the wound areas. mi grat i o n? the differentiation to restore the steady state of epidermis. differentiation process or activation of cell proliferation. epidermis were extended more downward (Figure 5(M)). crease of granular cells there. seminars for furthering this study. Journal of Pediatric Surgery, Vol. 6, No. 5, 1971, pp. Pathology and Bacteriology, Vol. 80, No. 1, 1960, pp. Skin Occurring at the Fetal Stage,” Development, Vol. 110, No. 3, 1990, pp. 671-680. M. T. Longaker, D. J. Whitby, N. S. Adzick, T. M.
ogy, Vol. 32, 1996, pp. 175-203. No. 2, 2004, pp. 187-195. 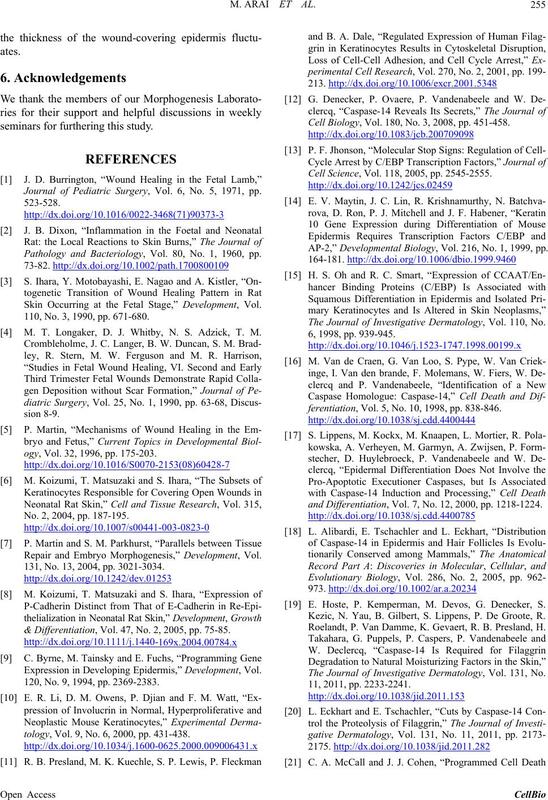 Repair and Embryo Morphogenesis,” Development, Vol. 131, No. 13, 2004, pp. 3021-3034. & Differentiation, Vol. 47, No. 2, 2005, pp. 75-85. 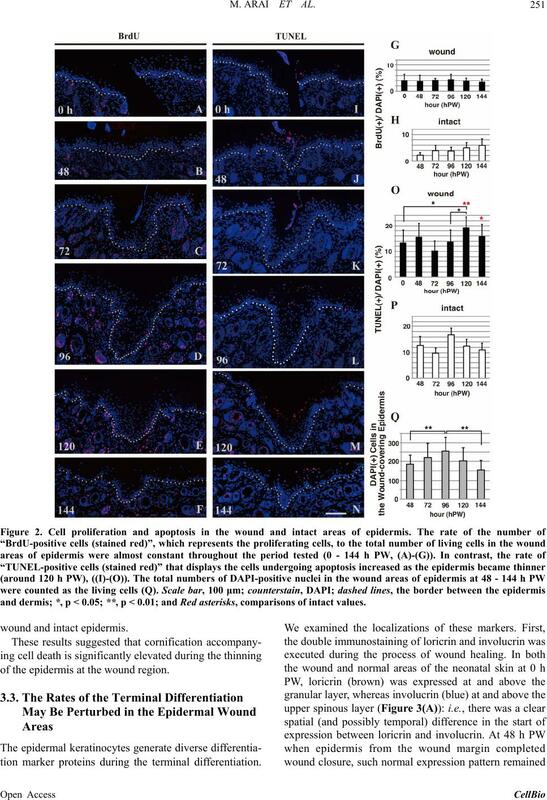 Expression in Developing Epidermis,” Development, Vol. 120, No. 9, 1994, pp. 2369-2383.
tology, Vol. 9, No. 6, 2000, pp. 431-438. Cell Biology, Vol. 180, No. 3, 2008, pp. 451-458. Cell Science, Vol. 118, 2005, pp. 2545-2555. AP-2,” Developmental Biology, Vol. 216, No. 1, 1999, pp. 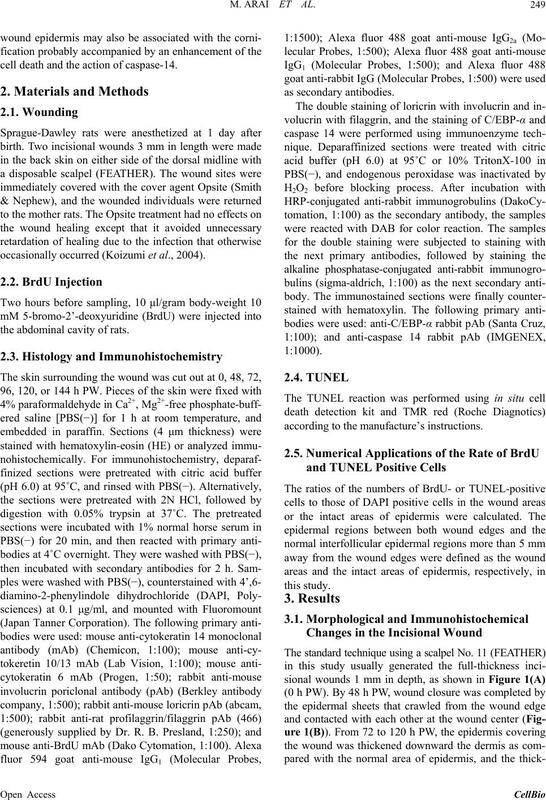 The Journal of Investigative Dermatology, Vol. 110, No. ferentiation, Vol. 5, No. 10, 1998, pp. 838-846.
and Differentiation, Vol. 7, No. 12, 2000, pp. 1218-1224. E. Hoste, P. Kemperman, M. Devos, G. Denecker, S.
Kezic, N. Yau, B. Gilbert, S. Lippens, P. De Groote, R.
Roelandt, P. Van Damme, K. Gevaert, R. B. Presland, H.
The Journal of Investigative Dermatology, Vol. 131, No. Dermatology, Vol. 97, No. 1, 1991, pp. 111-114. M. Rendl, J. Ban, P. Mrass, C. Mayer, B. Lengauer, L.
tion, Vol. 12, Suppl. 2, 2005, pp. 1497-1508. 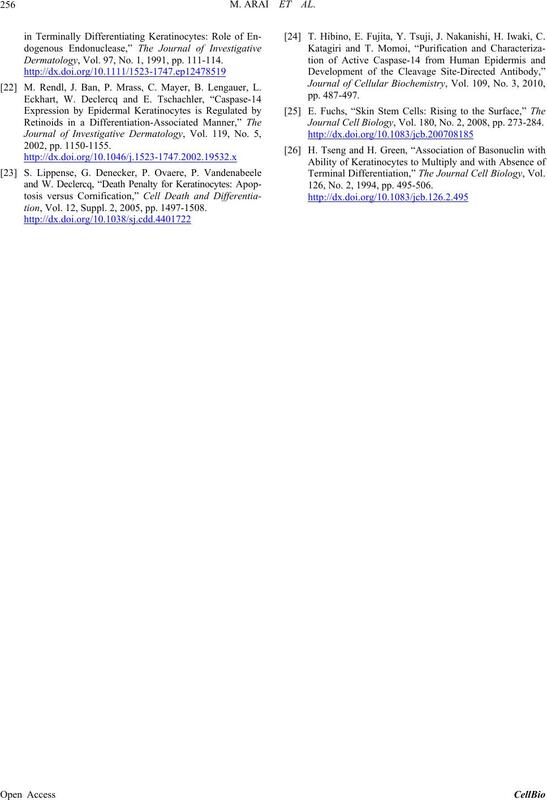 T. Hibino, E. Fujita, Y. Tsuji, J. Nakanishi, H. Iwaki, C.
Journal Cell Biology, Vol. 180, No. 2, 2008, pp. 273-284. 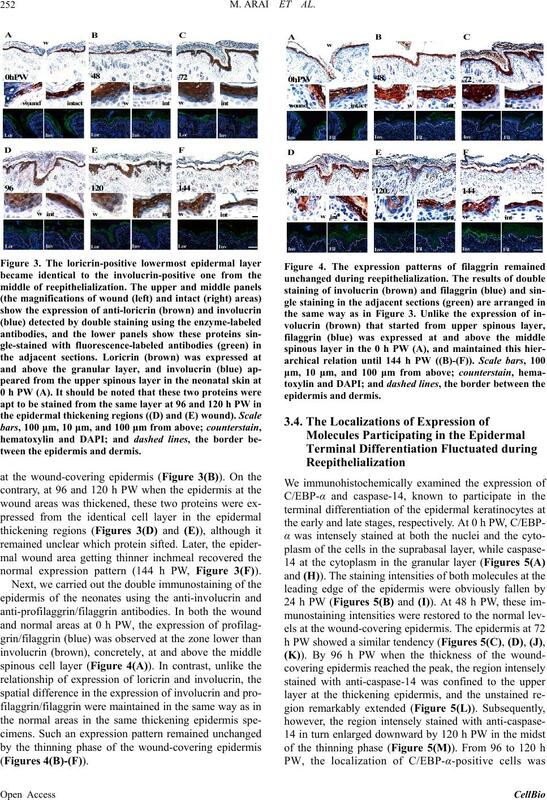 Terminal Differentiation,” The Journal Cell Biology, Vol. 126, No. 2, 1994, pp. 495-506.